The children gather together at circle time to greet their classmates and teachers. We begin early math readiness skills through our discussions about the day, month and year during calendar time. This is also the time when new learning units are introduced and discussed. Play is a vehicle of growth for the young child. During free play, children learn to interact with each other and play cooperatively. Playtime affords a child the opportunity to share, think and to problem solve. A variety of toys in the classroom encourages children to use their wonderful imaginations and build upon their creative, dramatic play while developing their gross and fine motor skills. Summer, winter, spring or fall - the children enjoy every season out on our extensive outdoor playspace. Outdoor play provides an opportunity for the development of large motor skills, eye/hand and eye/foot coordination. For a fun change and on rainy days, our fully-equipped indoor gym is used. Music is the universal language of our classrooms. It eases transitions and brings joy into each day. Our classrooms are equipped with musical instruments and lots of opportunities for children to explore rhythm and song. In addition, the children enjoy a music session with a music instructor once a week. It's not the product but the process that is important in preschool artwork. The children explore their creativity using a variety of art media. Paints (including tempera, watercolors and biocolors), markers, crayons, colored pencils, tape, glue, scissors, glitter and felt are a few of the many materials the children will experiment with in the classroom. 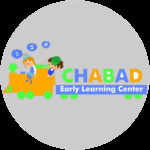 Our goal is to comfortably expose children to modern, oral Hebrew language. They will hear and learn Hebrew words relating to the seasons, Jewish holidays and units discussed in their classroom. Hebrew songs and games are incorporated into lessons. Preparing and celebrating Shabbat is a special time at Chabad. Challah baking is the first activity of the day followed by a warm and joyous Shabbat celebration. Parents are often invited to join their child's class for this meaningful weekly event.